We're coming into the season where bare skin is in. I personally, don't have perfect skin so I like to opt for a base that will give me a perfect look but still look like skin. 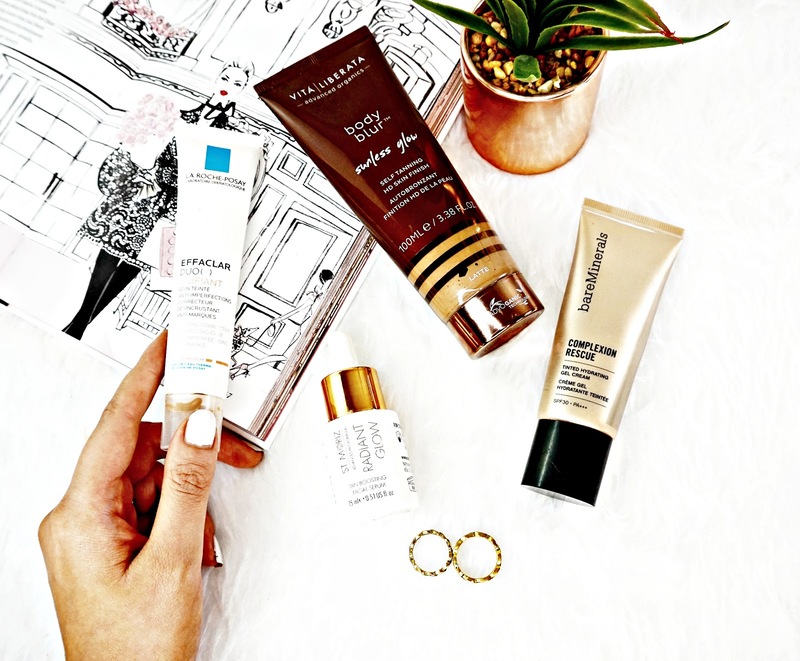 The bases that will simply enhance my skin rather than mask it. Here are a few of my favourites. This is such classic for me but I still really love this. This base is super lightweight, making it perfect for that, your skin but better, kind of look. It actually has pretty decent coverage to, but not in a masking, heavy way. It has a glowy finish which I love. The staying power is really good, it lasts all day on me, without any issue. La Roche Posay have the perfect offering of skincare with a hint of coverage in this moisturiser. The moisturiser itself is aimed at oily, blemish prone skin and promises to reduce breakouts in just 4 weeks. I don't have oily skin but I still really like this and find it quite hydrating. This gives my skin a uniform look and evens out my skintone, while still letting my natural skin shine through. The coverage of this is definitely light but it looks so natural on the skin. Now this is a tinted wonder cream for the body. It's essentially an instant tan that gives the skin that gorgeous skin kissed look while leaving the skin looking perfected. It covers veins and blurs stretch marks. The light reflecting particles leave the skin looking radiant to. This is easy to apply ( I like to use a tanning mitt) and it stays put all day. It's the perfect summer essential. This clever little serum contains all the benefits of skincare and tanning in one handy little product. It's designed to be mixed with your favourite moisturiser so you get a lovely sun-kissed glow without losing the benefits of skincare. I fake tan my whole body so if I'm going bare faced my face needs to match my body. This takes a couple of days to develop, when it does the colour it gives is perfect it's not Orange at all. It actually looks really natural like you've been on holiday.